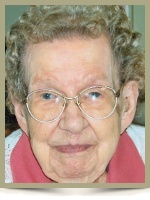 Grosvenordale – Theresa (Comeau) Bonczek, 101, of Matulaitis Nursing Home, formerly of Riverside Drive, died Tuesday, December 7, 2010 in Day Kimball Hospital. She was the loving wife of the late Victor Bonczek who died in December 1982. Born in North Grosvenordale, she was the daughter of the late Desire and Mary (Havey) Comeau. Mrs. Bonczek worked as a weaver for the former Cluett Peabody. She had also worked for the former W.T. Grant Co.
Mrs. Bonczek was a member of the Thompson Senior Citizens, Charter Member of Fr. Mathieu Circle of the Daughters of Isabella, a Charter Member of the Ladies of St. Anne, St. Jean Baptiste, Interfaith Stitchers, and was a communicant of Saint Joseph Church in North Grosvenordale. Theresa is survived by her daughter Clarice Guillot and her husband Paul of Grosvenordale; her son, Ronald Bonczek and his wife Virginia of Columbia, TN; four grandchildren, eight great grandchildren and six great great grandchildren. Relatives and friends are invited to visit with Theresa’s family from 9:00 to 10:30 am, Saturday, December 11, 2010 in the Valade Funeral Home, 23 Main St., N. Grosvenordale CT followed by a Mass of Christian Burial at 11:00am in St. Joseph Church, 20 Main St., N. Grosvenordale. Burial will follow in St. Joseph Cemetery. For memorial guestbook visit www.GilmanAndValade.com. Memorial donations may be made to St. Joseph Church, 20 Main St., N. Grosvenordale, CT 06255 or to Matulaitis Nursing Home, 10 Thurber Rd., Putnam, Ct 06260. Filed Under: Obituaries Tagged With: Cluett Peabody, Day Kimball Hospital, Fr. Mathieu Circle of the Daughters of Isabella, Gilman & Valade, Interfaith Stitchers, Ladies of St. Anne, Matulaitis Nursing Home, North Grosvenordale, St. Jean Baptiste, St. Joseph Cemetery, St. Joseph Church, Theresa C. Bonczek, Thompson Senior Citizens, W.T. Grant Co.
Mrs. Bonczek and our grandmother were roommates for a number of years at Matulaitis. It was always very enjoyable to visit with her while we were visiting Viviane. We will always remember her. May she rest in peace. What a long and wonderful life she had . Jackie remembers her when she first drove the senior bus trips . When I was a youngerster on the farm near red bridge , she would walk to the farm to spend some time with my mother , Albertha Therrien ..
Clarice and Roland , you are so blessed to have her this long . Our prayers are for you that you may fine peace in your heart . So sorry to hear about your mom.I know she was very special to you. My thoughts are with you and your family. Our Prayers and the love in our hearts go out to you Clarice and Paul and to Michael, Elaine, and Bill and to their spouses and children at this time of sadness in your lives. I’ll always remember your mom Clarice for her smile and kind words of support as I grew up. Hugs to you all from us. Our deepest sympathy and condolences on the loss of this wonderful lady who was not only a neighbor in North Grosvenordale while we grew up but a neighbor to my Mom & Dad at Matulaitus Nursing Home where they spent their final few years of life. May she rest in peace for eternity with God and may God bless all of the Family and provide comfort through the remembrance of Theresa’s long life.